I don’t much like the Economist… its not that their analysis is flawed, nor that its not informative, its world class in these respects, but the smug tones in which it is written. Too often I read “The Economist believes” in such and such, or “The Economist welcomes” the move by the Bank of England or wherever… as if the magazine is somehow a revered font of all knowledge to be paid tribute and courted. These really are minor quibbles in comparison to the wealth of information and good writing between its pages, but it irks me none the less. Tim Myatt was well pleased therefore (two can play this game!) when they launched Intelligent Life. It’s a quarterly publication, thicker and more, well, ‘lifestyle,’ than its weekly sibling. Here is a link to its website. So, why am I telling you about this? I was snatched by an article about Test Match Special… the BBC’s utterly bonkers, bewildering, unashamedly Public School, but sublimely brilliant live cricket commentary. I have been an avid fan for all my adult life; listening to the likes of Aggers, Blowers, Jonners and the boys (usually retired ex-cricketers… and boys is a far from accurate description…) discussing pork pies, the number 42 bus, the ‘turn of the pitch,’ the slope at Lords, and other meandering waffle while the rain hammers down on the English summer. 'Blowers' and 'Sir Geoffrey' enjoy a glass after a hard day rambling. 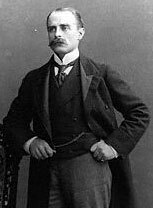 Francis Younghusband. With trademark Walrus tash. So, back to Intelligent Life. 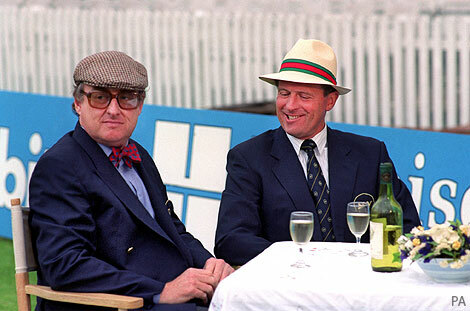 It seems that our friends across the pond can now access the TMS commentary, and find it as entertaining as me… David Thomson the author of the article, succumbs to waves of nostalgia as the semi-sporting ramblings are transmitted across the Atlantic. The article is here. You too can follow it on Five Live Sports Extra, 198 Longwave, or on the BBC’s Website. The final test against India kicks off tomorrow. I can’t wait!